ABU DHABI — A buoyant economy and skyrocketing demand for electricity throughout the United Arab Emirates and elsewhere in the Middle East have set the stage for unprecedented growth in the construction of generation and distribution facilities in the region. 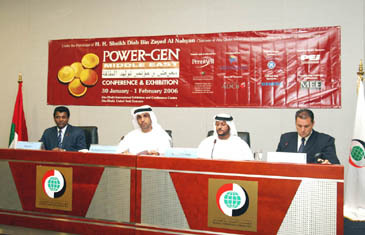 Power-GEN Middle East will be held 30th January - 1st February 2006, at the Abu Dhabi International Exhibition Centre. "This exhibition and conference is a way for electricity generation , transmission, and distribution professionals to meet the market," said Mr Nick Ornstien, Group Publisher and General Manager of PennWell Corporation's UK-based Global Energy Group, who along with their partner the General Exhibitions Corporation (GEC) based in Abu Dhabi, UAE, are producing Power-GEN Middle East 2006. With the need to almost double current electricity production by 2010 and a target to add 6,000 MW of installed capacity, from the present level of 12,811 MW, electricity and water authorities throughout the UAE are undertaking sizable projects, many of which will involve private investment. Strong demand growth coupled with significant structural changes within the electricity sector ensure the UAE will remain a key market in the Middle East for years to come. Further a field, the entire Middle East & North Africa (MENA) region will require more than 74 GW of additional capacity by 2010. Power-GEN Middle East exhibition and conference is now in its 4th year. If past success and current interest are any indication, next year's event will offer even more opportunities for international equipment and service vendors to identify profitable opportunities in the marketplace and meet decision-makers. "Power-GEN Middle East 2006 will be the biggest event of its kind held in the region, with over 100 exhibitors already confirming participation. We are expecting the event to have over 200 international and regional companies from the power - transmission, distribution and desalination section ," said HE Ahmad Humaid Al Mazrouie, of the General Exhibitions Corporation. A host of large-scale projects are already underway or currently coming up for bid in the UAE, Saudi Arabia, Iran and elsewhere in the region. Major industry players like Black and Veach, GE Energy and Hitachi amongst other world-renowned equipment suppliers will be exhibiting alongside Abu Dhabi Water & Electricity Authority (ADWEA), at Power-GEN Middle East. With many of the regional power and water suppliers, engineering companies, government and finance authorities also present, many opportunities will be available to conduct business at the event. Over one hundred industry experts wishing to present papers at the associated conference have already submitted their ideas well in advance of the event. "We recognise that innovation and advanced technology are essential ingredients in sustainable power and water infrastructure development in the region," said Mr Nigel Blackaby, Conference Chairman. "Power-GEN Middle East will offer a forum to present such ideas in engineering, regulation and finance affecting the region's power industry." Established in 1910, PennWell Corporation has developed into a leading international multimedia provider of business intelligence. With its headquarters in Tulsa, USA, PennWell has offices throughout the world, providing its partners with a truly global service. 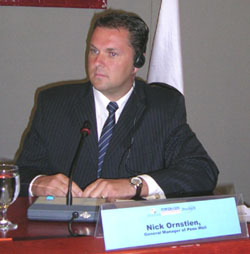 The company is active in a diverse range of markets, and has established undisputed market leadership in the fields covered by its Global Energy Group. Market leading international journals including; The Oil & Gas Journal, Offshore Magazine, Power Engineering International (PEi) and Water and Wastewater International are complemented by a large number of highly respected international conferences and exhibitions. POWER-GEN Exhibitions and Conferences are the world's leading business-to-business power generation events and stage in the USA, Europe, Latin America, Asia, India & Central Asia and the Middle East.